The preseason starts Friday, and the Sounders had many goings and comings. Here’s a look at who’s aiming to play where as the pursuit begins to take away the MLS Cup from Portland. With the signing Thursday of Stanford All-America selection Jordan Morris, 21, as well as 27-year-old midfielder and former MLS All-Star Michael Farfan Wednesday, the Sounders roster has jumped to 30 players. Training camp starts Friday, so now is a good time to look at the roster and see how the club tried to achieve its goals of adding positional depth while getting younger. The one position of no concern. Frei made a compelling case for being the best keeper in MLS last year, commanding a defense that surrendered the fewest goals in the league and making circus saves to help stay in close games. Despite separating his shoulder during Seattle’s summer of woe, Frei returned and dominated down the stretch. Lyon has picked up significant time with the reserves, but has also never played an MLS game. Miller broke his hand shortly after signing last season, and will likely spend most of this season with S2. He will benefit from the veteran mind of Perkins, who joined S2 as a goalkeeper coach after he was waived. Overall: The club is clear that it is confident in its keepers. When right back DeAndre Yedlin left for Tottenham last season, everyone worried about how Seattle would replace his speed. One year and an exercised contract option later, Mears has put most of those fears to bed, ably showing that the 32-year-old Englishman still has the pace needed to play his game, ranging out of the backfield. Yet Mears showed some signs of age late, the long drag of the season taking a toll. The acquisition of outside back Joevin Jones, acquired for a song (a first-round draft pick and allocation money) from Chicago, provides an apparent end to the revolving door at left back. It frees up Fisher, who showed great promise, to help relieve stress on Mears or Jones for a match or two. In the center, things look beefy. Marshall remains one of the league’s most dependable defenders, and at six-foot-four is an important part of defending set pieces (an area the Sounders struggled with mightily in 2015). Torres, if healthy at the start after recovering from a torn ACL, will be a defensive force. If not, then Evans likely will hold down the other center back spot opposite Marshall. Overall: Jones is a key addition that provides speed, versatility and flexibility to the back line, but the immediate and long-term fitness of Marshall, and to a greater extent, Torres, are concerns. Current: Osvaldo Alonso, Erik Friberg, Brad Evans*, Andreas Ivanschitz, Aaron Kovar, Cristian Roldan. The position of greatest need. A lack of midfield depth was a key factor in Seattle’s problems last season. The return of Ivanschitz and Friberg, both with a full off-season to get healthy and conditioned, will create opportunities to contribute, particularly in the wake of the departures of Pineda, Pappa and Neagle. Roldan and Kovar, second-year players, can be expected to play more regular roles. Roldan in particular proved a viable attacking option on the wing due to his speed, and made a solid case for a potential role as a defensive midfielder. Torres’ health is critical for the midfield, since his presence would free up Evans to play a defensive midfield role alongside Alonso. Farfan and, to a lesser extent, Schweitzer, will be under early pressure to compete for first team minutes, while Alihodzic and Mathers are better characterized as developmental picks. Overall: The midfield is younger and more energetic, but the durability of the additions (as well as the health of Alonso, who missed a career-high 12 matches and was at reduced fitness for many more due to injury) will be a concern. 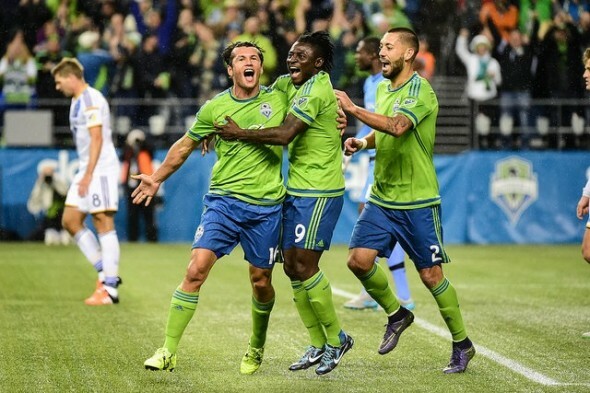 Valdez, Dempsey and Martins are Seattle’s three designated players. They were collectively paid $8 million last season. The Sounders will be expecting to get their money’s worth. For all three, health concerns linger. Martins missed a large chunk of the summer with a torn muscle in his groin, while Valdez had leg problems from physical tackles. Dempsey, in addition to missing games due to injury, will also have to keep his temper under control to avoid another ban like the three-match suspension he received for tearing up a referee’s notebook during an Open Cup match. When all three are in form and healthy, only the Los Angeles Galaxy can boast of a more intimidating forward attack than Seattle’s. Jones and Mansaray are still in development, but might see time off the bench through the middle portion of the season. Mansaray played 28 minutes in 2015; Jones played 107. Neither was ready for primetime, but training camp will go a long way toward determining what improvements have been made to their games. Craven will join Jones and Mansaray as a back-up option. The 23-year-old had an impressive showing with S2 last season, before being called up in July out of desperation for a viable option at striker. Unfortunately for Craven, he sprained his MCL in training after just three games, so he has yet to reveal his potential. Morris was signed Thursday after passing on a chance to play for SV Werder Bremen, the Bundesliga club with whom Morris had been training. The Sounders had first rights to Morris since the Mercer Island native was a member of the Sounders Academy. The Stanford junior led the Cardinal to its first national soccer title. He was the NCAA and Pac-12 player of the year and an All-America selection. Overall: It’s a unit designed to score a lot, and is still in a good place. The issue is whether there’s adequate support from behind to get them meaningful possession time. The addition of Morris and his obvious appeal will add intrigue regarding how quickly the Sounders bring him along. Perhaps you could amend the article with your thoughts now that the Sounders have signed Jordan Morris? Will he be our new #10?? Thank you! It will be very interesting to see how soon and how much Morris plays this season. He’ll probably get the Russell Wilson 2012 kid-glove treatment for the first half of the season, and emerge in the 2nd half needing to play more after the inevitable injuries to the “old guys”. Nice to see them retain a local kid and get younger in general. I would love to see the Sounders and MLS focus on developing American players instead of bringing in foreign imports. The Sounders are developing a nice core now of such players. That’s the plan. But there’s no way to do it except slowly, one player, one market at a time.